Evening brings on the nightly illumination of Horseshoe Falls along the Niagara Falls in Ontario, Canada. 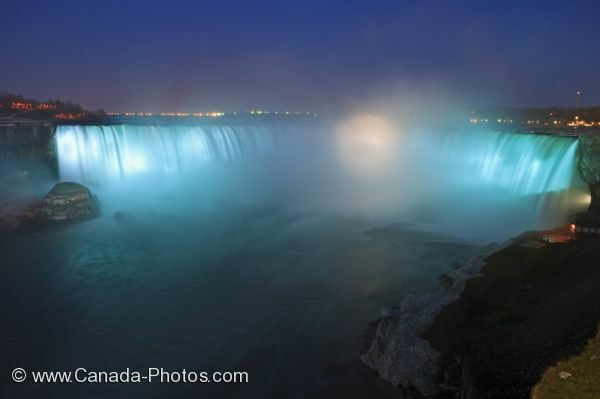 Along the Niagara River, the Horseshoe Falls is illuminated in the evening. The water glows from the lights as it cascades over the Niagara Falls. The night life of the city can be seen in the distance of the falls. The Horseshoe Falls are the most impressive of the falls of the Niagara River. Horseshoe Falls along the Niagara River at dusk during the nightly Falls Illumination, Niagara Falls, Ontario, Canada.